Next post: And what’s so bad about being an 80-year-old? 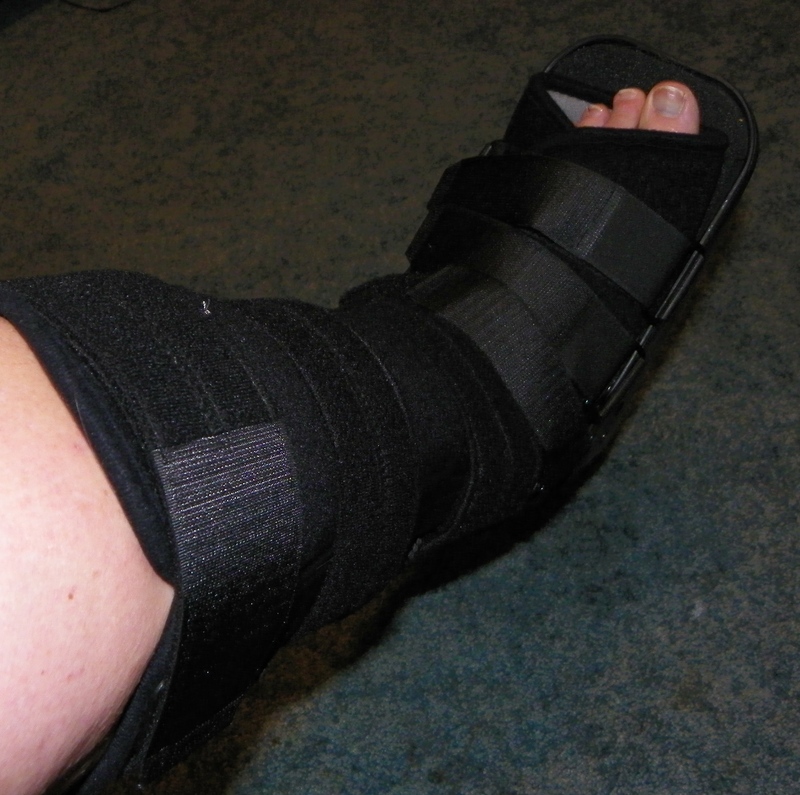 So a couple of days ago I wrote about my new normal, which is living life with a broken foot. It’s thrown me for a loop emotionally in a number of ways. The first evening after it happened and then most of my day the next day involved a lot of wondering and what-ifs and trying to plan for what was still somewhat unknown. It made for a stressful day, all run from the confines of my couch. Yesterday was much nicer. I got my two oldest girls off to camp, and my husband took me to a specialist who could really tell me what would need to happen to get my foot back to its unbroken self. In short, the breaks are simple enough that I only need to wear a boot, rather than a cast (hallelujah for that removable piece of hardware!! ), and I can put a little weight on it as I hobble about on crutches or the lovely walker my husband dug out of storage (he likes to collect these old things because someday they might come in handy). Partial weight-bearing actually helps my bone heal properly rather than resting it completely and letting it find its own sloppy way. Amazing. At any rate, my dear husband, who is a physical therapist, reminded me several times that this was the best news possible. I agree, with the addendum “in this situation.” The best news possible for me right now would be to travel back in time three days and tell myself to stop hurrying around so much, especially on uneven pavement. (Smack upside the head) But given that the deed is done and the bone truly is broken, knowing that at least I can just wear a boot that I can take off sometimes is great news. So my new normal for the next week or so is pretty much what I’ve been doing for about the past 24 hours: sitting on the couch with my leg up and reading or using my laptop computer. That’s the nice part. The tricky part involves when I must move around. Yes, I still need to get up and go to the bathroom. I pull myself up onto the very stylin’ walker, grab hold and walk very lopsidedly, putting the smallest amount of pressure on my left foot, preferably the heel or toes. I try not to crash into the furniture that lurks all around me. I lurch down the hallway and … well, I won’t go into too many details about that. I lurch back down the hall and collapse back onto the couch. End of the day is entertaining. The first night, my husband suggested I go up the stairs backwards, which worked but was also a workout. Man, it exhausted me. (He suggested before that that I just sleep downstairs, but I just wanted the comfort and semblance of normalcy that was my own bed.) The next night, after a comical but also nerve-racking shower experience during which my husband manhandled me in and out of the big shower downstairs and held onto me while I washed my greasy hair and stale body, I decided to heft myself up the stairs frontways, just kind of crawling. That was much easier. So I repeated that last night. At the top of the stairs, though, I still have to get myself back up from a crawling position into standing using the crutches. Not as easy as it seems, frankly. And last night, I went up without any help, so I had to crawl through my bedroom into the bathroom, which now has tile on the floor rather than carpet (thanks to our work of a couple of months ago, and which I generally prefer to the old carpet, but let me tell you in this case, it’s hard on the knees). By the time I’d made my way, pilgrim-like, into the bathroom area, my husband had come up with the crutches, and I pulled myself up rather like Gollum, via the chair he had also brought into the bathroom the other night, into a half-standing position. One big problem is that I cannot carry anything. Both of my hands are completely kept busy just keeping myself semi-upright and not too much in pain. So if I need to take one or two or three items from point A to point B, I must order around one of my minions. It’s astonishing how much we take for granted when all is working fine. It’s such a nice thing to be able to stand up, walk across the room, and grab a Kleenex. Or hop over to the kitchen for a glass of water (or some chocolate…). Or just GO TO THE BATHROOM, for pity’s sake. Yep, it’s a brave new world.